Is the United States Sitting on Trillions of Barrels of Oil? Five years ago, if someone told you the U.S. would be independent in 15 years, you might have thought that person was crazy. But thanks in large part to technological advancements in drilling, it's very possible that North America could be energy independent by 2020. Given this fundamental change, if I were to tell you that America may have an oil source that's more than the rest of the world's combined proven reserves, would you believe it? There's a unique geological formation in the U.S. that could hold as much as 6 trillion barrels of oil, but there's a chance that we may never even touch this vast resource. Let's see why we haven't really touched it, and why we may never use it. Kerogen lies deep under the surface, and very little is known about it. Like bituminous oil sands, kerogen is a solid organic matter that isn't extractable like traditional oil. Unlike bitumen, kerogen can't be extracted through an organic chemical solvent. It's an organic material within the rock itself, and the rock must be thermally treated to get the oil out. Total deposits of this type of resource is in the trillions of barrels, but much of it is trapped in places where the total oil extracted per ton of rock is so small as to not be economically feasible. For a kerogen deposit to be even remotely feasible, the U.S. Department of Energy estimates that the formation would need to be at least 15 feet thick and yield more than 15 gallons per ton of rock. 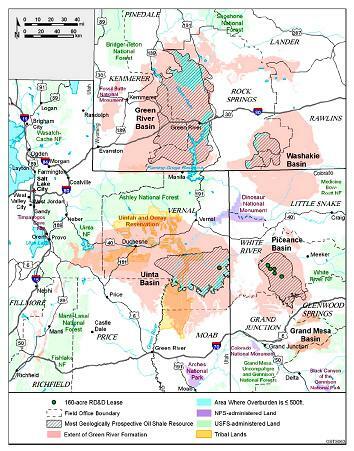 The EIA estimates that there are about 2.9 trillion barrels of recoverable kerogen deposits worldwide, and nestled tight within the Wind River, Unita, and Wasach Mountains of Wyoming and Colorado is the largest kerogen deposit in the world, with about 1.8 trillion barrels of technically recoverable oil. If all of this oil were economically recoverable, we could supply U.S. energy demand for more than 250 years based on current demand. While it may seem attractive at first to tap these fields, we must also consider the economics of such an endeavor. Since kerogen deposits can't be pumped to the surface like a traditional well, we need to use two methods: underground mining with above-surface thermal treatment or in situ thermal treatment. The latter is an experimental method Royal Dutch Shell developed that heats the source rock over a few years until the source organic material has vaporized and can be recovered through well extraction. Several major oil and gas companies have done some research in this field and hold patents on some methods, but Shell has been the one major that has pushed the science in this field. Another obstacle for this region is that more than 80% of all the land these resources are located on is federally owned. To date, the Bureau of Land Management has offered exploration contracts to four companies: Shell, Chevron , IDT , and Oil Shale Exploration. Any way you try to do it, kerogen extraction is extremely energy intensive and therefore expensive. To extract 1 million barrels per day -- about 5% of U.S. daily consumption -- it would require 12 gigawatts of dedicated electricity generation, 46 billion gallons of water per year, and mining and remediation of 500 million tons of rock per year. Just to give those numbers a little perspective, that's enough power for 9 million homes, a 45-day water supply for all metropolitan New York City, and 50% of all coal produced in the U.S. last year. Based on a report in 2005, today's oil prices would need to be in the $110-per-barrel range before it's considered economically feasible. This number could be much higher, though, because much of the data it's based on is from the 1980s and environmental regulations are much tighter than what they were back then. Also keep in mind that kerogen extraction technology is not yet complete. Shell has garnered some token levels of production, but the most recent EIA Energy Outlook Report doesn't see significant production from kerogen extraction until 2035. There are several economic, technological, and political hurdles that need to be crossed before kerogen extraction can be made a reality. By then, the Organization for Economic Cooperation and Development estimates that the price for a barrel of oil could be well over $250.So the market could easily handle the elevated price to produce this source. On the other hand, if oil prices have gone this high, it may be possible that people will be looking for an alternative energy source. Advancements in natural-gas and electric vehicle technology are making the transition away from oil even more possible. Clean Energy Fuels currently advertises a gallon equivalent of natural gas to be $1.50 less than diesel. Fuel costs like this could be very attractive to fuel-heavy industries such as trucking, which consumes more than 25 billion gallons of fuel per year. The possibility that oil will reach such high prices would prove to be extremely prohibitive to economic growth. So hopefully we'll be able to diversify energy sources enough to mitigate the impact between now and 2035. It may be best to think of the Green River Formation as an "in case of emergency, break glass" resource: While we can hope we'll never need it, it's good to know it's there. The article Is the United States Sitting on Trillions of Barrels of Oil? originally appeared on Fool.com. Fool contributor Tyler Crowe has no position in any stocks mentioned. You can follow him at Fool.com under the handle TMFDirtyBird, on Google +, or on Twitter, @TylerCroweFool.The Motley Fool recommends Chevron and Clean Energy Fuels. Try any of our Foolish newsletter services free for 30 days. We Fools don't all hold the same opinions, but we all believe that considering a diverse range of insights makes us better investors. The Motley Fool has a disclosure policy.